Inspiration and elegance find a marvelous match with Joyeux Noel. White and gold meet pink and green with lots of glitter and a touch of sparkle in its beautiful papers. The heart of Christmas is found in its inspiring message and the richness of tradition. If this sounds like your kind of holiday, grab this digital scrapbooking bundle today! 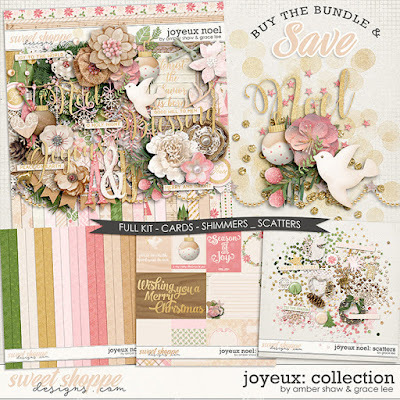 Papers and elements including a dove, flowers, ornaments, word art and more.